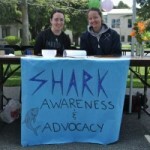 Inspired by an internationally acclaimed documentary, two Mills College undergraduates organized a screening of “Sharkwater” as part of Earth Week to spread awareness to the campus community about shark finning, the killing of sharks for their fins. Seniors Tarra La Valley and Emma Giboney’s newly created Environmental Studies club seeks to rally Mills women to petition the selling of shark cartilage products in local health food stores, which contributes to an estimated 100 million sharks that are killed annually for their fins. This entry was posted on Friday, July 16th, 2010 at 3:54 pm	and is filed under news. You can follow any responses to this entry through the RSS 2.0 feed. You can leave a response, or trackback from your own site.